News from LMCU: Our $25,000 Home Makeover Sweepstakes Has A Winner! Our $25,000 Home Makeover Sweepstakes Has A Winner! With a record 448,654 entries, this year’s $25,000 Home Makeover Sweepstakes has found a winner in Roger Morse of Alto, MI! After he and his wife Laura entered some 90 times between them, their number came up in the Monday, June 5 drawing, giving the couple the resources for their planned kitchen remodel. 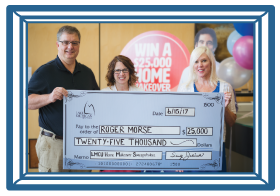 Congrats to the Morses, LMCU members since 1992, as this year’s winner of our annual $25,000 Home Makeover Sweepstakes!